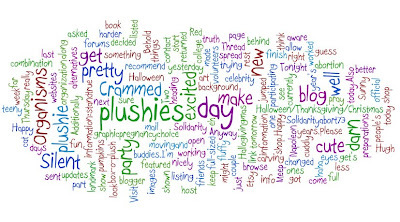 Hello plushie lovers, if any of you still come to this blog! I know it's been ages, and I apologize. Since I started the process of getting a new job a couple months ago I haven't been making anything plushie-like. We actually sold something a couple days ago (happy surprise! ), so I figured I'd check in here. One of the pumpkin ornaments I made this fall was purchased and sent off to the sunny land of Florida. We're buried in snow here, so I'm kind of wishing I'd have shipped myself too. These are last year's pumpkins. We'll be carving new ones tomorrow! Return of the Crammed Organisms! I just got a box-o-plush in the mail! The plushies I'd sent to be in the Crammed Organisms show returned to me today, along with the official Crammed Organisms book! That's the part I was really excited about, because... well, look! That's right, a full spread of Red Thread Plushies!!! And guess who get's a page all to himself (with a landmark in the background, no less)! I'll be listing our celebrity friends in the shop over the next few days, so keep your eyes open for updates! Additionally, here's the plushie I made yesterday, Sunny the cat! She's pretty darn cute and very fluffy and cuddly :) She's currently listed in our shop. I've been trying harder to make things this week. I decided that I wouldn't allow myself to get on the Etsy forums until I make something that day. So far it has worked nicely! Behold! Two new teeny plushies, Meep and Hugh. Cute, eh? I think I might start working on a full-sized plushie today. Also, we are "featured" on a blog! Well, in truth the blogger asked for volunteers and I jumped at it... haha! Anyway, here's your link. Be sure to browse the rest of the blog too- it's fun to see how people's art has changed over a couple years. Please pray for those participating in the Day of Silent Solidarity and those they come in contact with! Look! A new non-custom plushie! Gasp! This is Scrappy the bear- he's a pretty sweet little guy. And he has a rockin' yellow scarf! It seriously took me days to figure out what to do for his face... it was pretty ridiculous. What do you think? The scarf was a last minute idea and I really love it- it adds so much character!